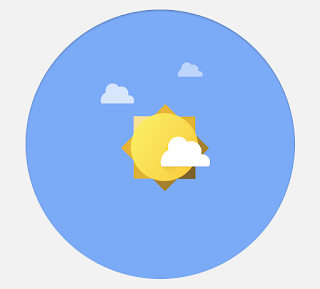 Recently, I received an email alerting me to a new offering from the folks in Redmond, Washington. With a title like Microsoft Mathematics 4.0, I was immediately attracted to what was potentially in store. A well written paragraph offering "a large collection of tools, tutorials, and instructions designed to help you tackle math and science problems quickly and easily" hooked me in further, though Microsoft had me at the price of "free." Let's take a look to exactly what one gets with Math 4.0. Installation - The lightweight program was quick to download and easy to install. The product website features a teacher's guide as well as an 18-page step by step document to help you get used to the program. My recommendation is to jump right in and start exploring after installing, but once you do, you'll soon realize (in a good way) why there's 18 pages of documentation. 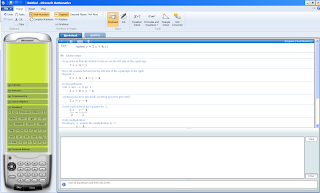 Worksheet - The program contains two tabs - Worksheet and Graphing. 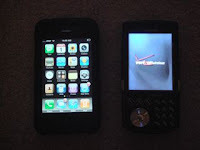 On the left side of the screen, there is a fully featured graphing calculator, though it is not identical to the ones typically used in classes. I was immediately drawn to the large text box on the bottom where I was prompted to "Type an expression and then click Enter." After punching in a simple slope-intercept equation, the program posted a solution that solved for x. Better yet, upon clicking the "+" sign next to solution steps, I was able to see how the problem was solved, including detailed narration of each and every step. Graphing - Switching over to the graphing tab, I entered the same simple slope-intercept equation, and upon pressing graph, I had a 2D plot on screen and totally movable. Graph controls include a Trace playback which gives you coordinates of every point along the graph, and you can stop or pause and drag the cursor to any specific point on the graph. 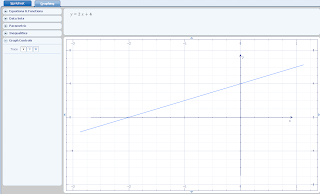 The graphing tool handles inequalities (with shading), parametric equations, circles, and more. 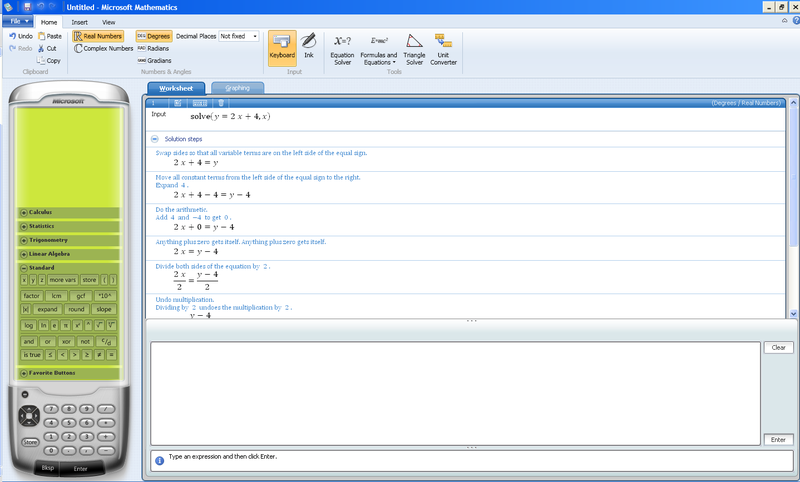 Home: Aside from the above mentioned features, Mathematics 4.0 comes with an Equation Solver, which allows for quick access to the viewable solution steps as discussed above. Under Formulas and Equations, you can choose from many popular items, including the ideal gas law for chemistry. Users apply some plug and chug, only this time, the application does the chugging for you, again showing you the steps taken if you want to see them. Triangle Solver offers the option to calculate missing sides or angles and shows you the rule, triangle type or additional info (altitude and area) for the created triangle. Lastly, a Unit Converter is included for all of this metric conversions that so gave us fits in science classes. Even More? Yes. With the ability to export to Word, save your graph as a picture file, and inking capabilities (can you say Tablet PC? integration? ), this little program has all the perks for exactly the right price. I can think of two downsides: 1) Windows only (duh, it's Microsoft) and 2) the calculator is not a graphing calculator emulator, meaning it doesn't have the same look and feel as the calculators that many of our students use on a daily basis. A small price to pay for such a robust product. I strongly recommend this for all math and science teachers.